If you would like to be on my e-mail list for new savers/updates/fixes, click here. What is the Matrix_ks screen saver? It's unique because it uses the actual matrix characters, not imitations. Includes automatic support for 1-5 (and more) monitor configurations! You don't have to do anything, it will recognize your other monitors automatically. You can choose color schemes! If you're tired of the lime green matrix animation, you can now choose red, yellow, white, blue, gold, pink, or even rotate each of them! You can also	specify how often to rotate them. Includes option to display an image within the Matrix - choose any jpg, set the location and transparency of the window! Includes (optional) user and system information displayed at the top of the screen. Includes option to display text from a text file (instead of user/system info). See screensaver settings window for options. Includes options to play your favorite MP3 files while the screensaver plays. You can download this sample music text file (playlist file) which shows the format needed. The text file MUST be in the same folder as the screensaver. Save the sample file above to your local system. Edit the sample playlist file and put the path of your MP3 instead of mine. Drop it into your C:\windows\system folder (for example). Go to the screensaver settings and under the Music tab, browse and select the C:\windows\system\Matrix-ks.txt file. A sample of an html file with quicktime links is here. A cool site to automatically generate html for embedded media is here. Improvements in the animation logic as well as mouse-movement stop of the screensaver. Includes a small digital clock in the top-right of the screen. Enhancements to allow for more variances of resolution and monitor combinations. For example, if your main monitor is a laptop and your other monitors are larger, but not your main monitor, just set the monitor configuration options in the screensaver settings window. Added the Purple matrix color option. Allow the Rotate Color option of 0 minutes, which will rotate the color about every 10 seconds. If you UNcheck the "transition quickly" option, this creates a really interesting effect as it rotates the colors, continually overlapping the colors. You can choose a JPG image to show in the matrix! You can also set the location of the image as well as the transparency level! If you set the transparency to 50, the image looks like it's within the matrix. This is fun for logos or other favorite jpgs. Other misc fixes and improvements. The clock font color is customizable (see screensaver Setting window). Multi-monitor custom configuration improved - now you can set the starting height position. Multi-monitor custom configuration - you can optionally specify your left-most monitor, width and height resolutions. This is for those who have odd/custom monitor configurations. Any additional files MUST be in the same folder as the screensaver. Other efficiencies and minor improvements. Added the White color theme. The top text color and text LCD background colors now automatically change based on the color theme, as well as the clock text color. Music! A new "Music" tab has been added to the settings window. You can now specify a music play list (plain text file) of any MP3's files! See download links for a link to the sample text file. The text file MUST be in the same folder as the screensaver. Other efficiencies and minor improvements to the picture show and other logic. If your main monitor is on the right, it now shows the screensaver on both screens. If you have a tri-screen, this 'should' work as well. You can now set the color of the clock font. The mini-slideshow now runs with a lower priority, so the matrix code animation doesn't slow as much on older machines. Mouse movement screensaver abort is defaulted to off/false. You must click the mouse to abort the screensaver, unless you have the mousemove option checked. Setting tabs are more intuitive. Code speed setting added. You can now adjust the speed of the matrix code! You can define top position of mini-slideshow window (relative to screen area). You can select image transition types, including 'random'. Very cool! You can define the delay time of the transition frames. 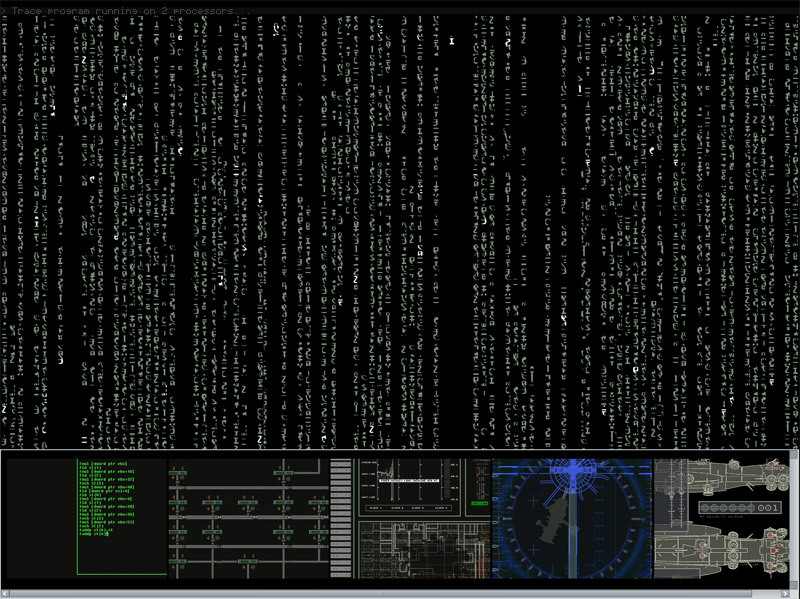 Above screenshot shows the Matrix screensaver with the "blue" color option. Below is a screenshot with the newer features including the white matrix option and the web window option with four quicktime movies playing at the bottom of screen. Click thumbnail for larger view. Windows 95, 98, ME, NT, Win2k, XP, Vista, Windows 7, Windows 8, possibly the buggy Windows 10. Download latest Version (3.6): Matrix_ks.exe (~1.6 meg - includes install/uninstall). If you can't get the install to work, you can download the files in a zipped file and install manually. Movie clip downloads for display in the screensaver. Note: You might want to convert these to SWF (flash) or use HTML5, so they'll autoplay and autoreplay better in the screensaver. Keep in-mind, this screensaver allows for any html to be shown in the html window (see screensaver options). Just use your Embed tags, etc, to show the clips however you like. What do I do when I use multiple monitors with different resolutions? This is why I added the Monitor configuration tab. You can specify the exact dimensions of your full set of monitors. Remember: Everything is based on your main monitor. If you have 800x600 on your main monitor and on the right you have your second monitor at 1024x768. (this is 0 because your main monitor is the first (leftmost) monitor). How do I use the text file feature? Go to the screensaver settings for this screensaver. You'll see a tab labelled "Top Text Display". In that tab, you'll see options to use a text file to display the top text displayed in the screensaver. There is not currently an option to have the screensaver display Both the system info and your text file at the same time. "Your matrix SS is the best I found." "I Love the Matrix Screensaver! Totally awesome! Everytime I pass it on I will make sure you receive a $5 donation!Totally worth it!" "Your Matrix Screen Saver MUCH better than the Warner one!" "AAAAAHHHHHHH!!!!!!!!!! Mind blowing job!!! I got goose bumps when I saw my name appear on the screen! WICKED!!!" I just thought i'd give you some compliments, this screensaver is BRILLIANT. Its the first matrix style screensaver i've found that actually works with my dual head setups. I have it on all 5 of my machines now, and it looks very very cool :P Not only that, but it fits my red\black theme perfectly. I found your site while I was searching for *cough* ANOTHER multimonitor Matrix screensaver, but I am so damn glad that I found yours instead. Yours is, by far, the very nearly infinitely superior product. The graphics are amazing and the interface is top-notch and user-friendly; the total experience is almost too good to believe, but it's for real...it's incredible! Well done. Thank you for an excellent contribution. You have my sincere respect. "The Matrix screen saver is GREAT, hats off to you." "Ok, I just formatted and lost the matrix_ks saver so I came back like 2 days ago and found it totally updated omgomgomg!!" "Thank you for the matrix screen saver its cool and I will be back to this site in the future for more!" "The Matrix Screensaver is awesome! I love it, good work." "Just wanted to take the time to let you know that you did a great job on that screen saver it is real good!" "I love your Matrix screensaver. It is the best of all that I have seen." "Oh MAN! The Matrix is like LITERALLY being IN the Movie! WOW!!!!!!" "I LOVED your matrux screen saver! THANKS SOO MUCh! it is better than all of the other ones! none of the other ones worked on my machine... or they were too slow and didnt look right...your worked PERFECTLY and it was ausome. you people RULE!!!" "This is the best matrix screensaver I have seen. The last one I had from like 5 years ago only ran in 256 color mode with no way to adjust the speed or color. Thank you for taking the time to create such a cool screensaver. You did a much better job than Warner Bros. by a long shot." "The Matrix code scrensaver is not only the best one around that i have found, its looks authentic, especially with my 3 monitors showing it. Perfect, just perfect. I am going to tell my friends about you. good luck with everything." "Thanks for creating such a great Matrix screensaver! When I saw it posted, I didn't think that I would like the different color schemes (figured I'd just keep it set to standard green), but now the changing colors are my favorite thing about it!" "I really enjoyed your Matrix screensaver, thank you for your effort. It's the best I found, keep up the good work! Other ones really s*cked, they went really fast, and didnt take up the whole screen, yours is a eleven out of ten, others, 0.1 out of ten. thank you for the best matrix screensaver out there, Thanks!" "I just have to congratulate Kelly Software for standing up to your reputation for having the best Matrix screen saver, It's true." "Hello, By far, your screensaver is the best and only screensaver that comes close to the movie I have ever seen and have come across (a lot better than the screensaver on the official site). Again, excellent work and keep it up!!" The mouse-move abort still isn't working perfectly. Something is still triggering it to abort the screensaver - without you moving the mouse. If you find this happens to you, just uncheck the option in the settings to not abort for mousemoves. Phil says: "I had installed some new video codecs on my Vista machine, and suddenly my screensaver had stopped working. Even after uninstalling the codecs, the problem remained. Despite the suggestions you sent me (which were, granted, pretty good ones) nothing I tried resolved the issue. Finally, though, I recently figured it out. Somehow, Vista's "Data Execution Prevention", which is supposed to protect Vista system files, was shutting down the screensaver every time it started. Despite what Vista thinks, I'm pretty sure the freakin' screensaver isn't going to destroy my system, so I turned "DEP" off (or, rather, told it to only run on actual system files, instead of all files), and I suddenly had my screensaver back! I just wanted to give you the heads-up about this in case anyone else has experienced a similar problem. Thanks for a great program!" Be sure to sign-up for my free e-mail newsletter - stay up-to-date on my latest versions! View more of my screensavers! Matrix_ks (Matrix) screen saver, home page for my Matrix screensaver.